The results of implementing Dr. Marshall's Health Program have been nothing short of spectacular! 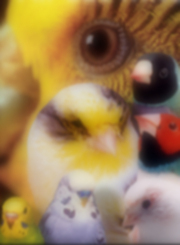 Our birds' energy levels are elevated, colors are brilliant, feathers are tighter. The offspring are larger than their parents and have a strength and endurance that we have never seen in our birds before. The use of medication has been greatly reduced, an achievement we attribute to our adhering to Dr. Marshall's Health Programs, and our regular use of his KD Water Cleanser and Megamix water additives. TurboBooster is a concentrated form of energy, coupled with stress relieving vitamin B and the oil based breeding vitamins A, D, E, and K. It provides birds with the fatty acids, protein and minerals necessary for good health, fertility and breeding results. It has been designed to replace or enhance softfood and soaked seed as a source of energy and protein for feeding parents. It provides every benefit of soaked seed, but none of the potential dangers, because it is a sterile product. 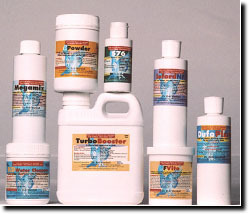 TurboBooster is most often used together with F-Vite and ePowder on seed or mixed into softfood. TurboBooster should always be kept refrigerated. Seed on which it is coated should not be left in the cage for longer than 24 hours when temperatures are above 72 degrees F (25 degrees C). Uneaten remnants of any soft food or sprouts which have been mixed with the TurboBooster should be removed within 6 hours. F-Vite is a grit, vitamin and mineral powder that replaces the need for any other form of grit. It provides all the necessary minerals, mineral salts and trace elements in a sterile form. The shell grit portion of F-Vite is baked at high temperatures to ensure sterility without damaging the potency of the minerals or grit. 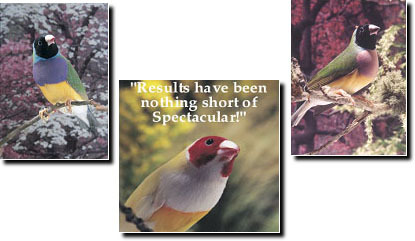 Unlike other grit or oyster shell products, you needn't worry if F-Vite becomes damp or wet because there is no bacteria in it that can grow, multiply or cause harm to your birds under damp conditions. We recommend sprinkling it over your bird's seed mix or adding small amounts of it into crushed, sterilized egg shells for a few months before providing it "free choice" in a treat cup. ePowder is made from the by products of cultured yeast and is an excellent source of Thiamin and B vitamins. It provides a constant supply of energy that promotes good health and protects the birds from stress. It accelerates growth in chicks and energizes feeding parents so that they can feed to their offspring's full potential. DufoPlus is an injectable grade vitamin supplement. This is the purest form of multivitamins available. It is a potent, water soluble, sugar free multi-vitamin that contains vitamin A, all of the B vitamins, especially Thiamine, vitamins D and E. To protect its potency, it is preserved in nitrogen and the concentrate should be kept refrigerated at all times after opening. Because it is sugar-free, it can safely be left for 2 days without harm from bacterial growth. DufoPlus is normally used in combination with Ioford. Ioford is a health stimulant for caged birds containing iodine, iron, zinc, calcium, magnesium and vitamin D. These last 3 ingredients are scientifically balanced to provide hens with exact proportions for the production of eggs. It is used in a cocktail with DufoPlus for 2 consecutive days each week in most Health Program. The concentrate should be kept refrigerated after opening. Megamix is a blend of unbuffered citric acid and surfactants which acidifies foodstuffs and water being stored in the crop. It is also used to maintain normal, small, firm droppings in birds housed in humid or damp conditions. In this way, it protects the health and vitality of the flock by counteracting the negative effects of poor weather conditions, which raise the alkalinity of the gut and make birds susceptible to the "wet diseases" of E.coli, Thrush, molds and fungus. It can also be used continuously in those aviaries using water supplies that have a pH above 7.5, for this will also expose the birds to the "wet diseases". An added benefit is that it will also prevent growth of bacteria, mold or fungus in the drinking water receptacle and keep them sparkling clean. KD Water Cleanser contains organic acids that protect the health of seed eating birds by acidifying the water they drink and thus the contents of the crop. This is especially helpful to young in the nest who are most at risk from contaminated food because it stays in the crop for a prolonged period of time. The air we breathe is full of mold, bacteria and fungal spores that are practically impossible to remove. 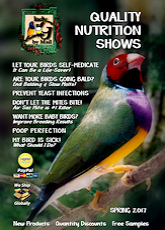 As these settle on our bird's food and water supply, they begin to multiply which can cause problems for our birds, especially those not in top health or living under stressful conditions which will suppress their immune system. Contamination entering the mouth in the form of foodstuffs and water is the most common cause of disease in our caged birds. There is no residual effect of KD on the birds because it is immediately neutralized after the food leaves the crop and enters the highly acidic stomach (proventriculus.). The blend of organic acids, hydrogen ions and surfactants also helps to keep the water containers clear of sludge, bacteria and fungus. Dr. Marshall's supplements have been designed to perform together, operating as a system, each working in synergy with one another to produce the best possible outcome. 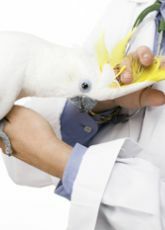 While an individual supplement may enhance your bird's wellbeing when used alone, we recommend following the Dr. Marshall's Health Program specifically designed for your specie of bird to obtain optimum health and breeding results.